Please take into account that the Yoga Adityam system is a series of practices from India that I uncovered and discovered and not something I invented or created. The world of Yoga is complete and perfect as it is and there is nothing to be added or subtracted. Yoga Adityam is simply traditional yoga that somehow became obscured by the passing of time. I humbly attempted to shed light on what once was lost, and with the visual help of the Kirlian photos I was able to confirm what was previously discovered by the great Rishis of India. I carefully designed the series with the help of such cameras with the purpose of speeding up spiritual growth and understanding on all practitioners. Yoga Adityam was born out of the necessity of spiritualizing yoga in the West. This new system evolved through many years of yoga practice and spiritual experiments. During my long period of study and exploration, I received instructions from accomplished yogis and siddhas, both in India and the West, and after many years of dedicated practice, I came to a deep understanding of the principles of how energy moved through the three bodies during the practice of asanas, pranayama and meditation. I carefully analyzed the many ancient yoga styles described in classic yoga books in India, and compared them to the yoga styles taught in the West in various countries. When I followed the history of any particular style to its ancient roots, I was confronted each time with the revelation that many vital parts were missing when it was presented in the West. For example, in the practice of asanas, not only was breath retention often missing, but also the use of bandhas (yogic body locks), Drishtis (positioning of the gaze), mental concentration and many other vital aspects of true yoga practice were completely absent. My purpose is not to criticize others’ styles of teaching; there are many good schools in the West that follow a system designed to foster an experience of inner expansiveness, and this is good. My intention is simply to elucidate the missing vital components of the practice, so that all practitioners can benefit. The principles of Yoga Adityam can be applied to any style of yoga practice and bring forth great spiritual benefits. The series presented in this book were carefully designed to make the physical body strong, lean and healthy, strengthen the nervous system, clean the complex configuration of nadis (astral channels of energy) within our bodies, awaken the Kundalini (the powerful spiritual energy dormant in every human being), open the chakras (psycho-spiritual centers), and help every practitioner realize the great truth of our eternal and infinitely vast nature. In this book you will find specific and clear instructions on how asanas, pranayama and meditation should be practiced. 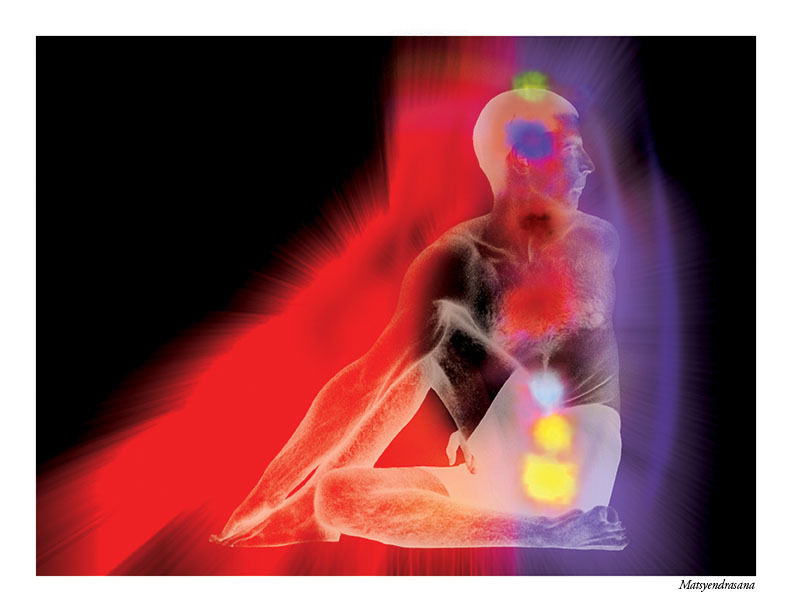 As was done in the first two volumes in the Yoga Adityam series, these instructions are given in conjunction with Kirlian photographs which vividly depict the changes which occur within the energy body while each practice is performed. This is truly a revolutionary approach to the science of yoga and health. The name Adityam comes from the Adityas, who were considered Gods of the Sun in the ancient Hindu scriptures; the name is appropriate due to this system’s focus on the sun-like chakras, and the solar energy which empowers them. In addition to teaching yoga for two decades, I have also been a practitioner of Surya Trataka (gazing at the sun) for many years, and through this practice I have been exposed to an amazing new reality: the sun is in fact a conscious being that is constantly transmitting not only light but higher knowledge to us, if we are open to receiving it. The Yoga Adityam system is designed to harness the sun’s energy and bring it into our bodies and minds in the most efficient and beneficial way possible. Also inherent in the name Adityam is Aditi, which means ‘limitless’ in Sanskrit. Aditi refers to the all-powerful Goddess who is considered to be the Mother of all gods and the sole source of the twelve zodiacal spirits from whom the entire cosmos emerged. Aditi (also known as Devi, Lalita, Kali, Durga, and numerous other appellations of the Goddess) is the sweet manifestation of the all-pervasive eternal and feminine expansion that covers the whole universe, the loving motherly energy that will protect the practitioner during the course of their yogic training. Aditi is unrestrained energy, invisible but palpable. She is omniscient, all-encompassing, omnipresent intelligence itself, resting in a state of eternal peace and equipoise. She is the creative, loving principle known as Prana Shakti, the life energy that is inherent everywhere and in everything. Aditi manifests within each one of us as Prana (the life force), and circulates throughout our nadis (internal energy conduits). Aditi also takes the form of Kundalini, which is latent at the base of our spines – and it is by her grace that the Kundalini awakens. Yoga Adityam is an open gateway to an expansive and divinely fulfilled life. We heartily welcome you through the portal! Exercise programs in the West are usually designed to stimulate cardio activity, and when we engage in such exercises, our heart speeds up in conjunction with our breath and the ‘fight or flight’ response (also call hyper arousal or the acute stress response) gets activated. ‘Fight of flight’ is a hormonally triggered response that occurs within our body when we are facing a dangerous situation. For instance, if we are under physical attack of some kind, or running for our lives, symptoms of ‘fight or flight’ will manifest in our bodies. What’s most interesting that even thinking in a fearful way can trigger this response. Walter Bradford Cannon came up with the theory of the ‘fight or flight’ syndrome by observing the physiology and behavior of animals when they are under threat. He states that animals respond to intimidation with over-stimulation of the sympathetic nervous system. During these episodes the adrenal medulla manufactures a variety of hormones that trigger the emission of catecholamines such as the hormones epinephrine (adrenaline) and norepinephrine. When under pressure, the animal is hyper alert, and in a matter of seconds it chooses to either fight or flee. The autonomic nervous system controls the heart, lungs, digestion, pupillary response, urination, and sexual excitement. This system manages the flight-or-fight response and is affected by the sympathetic and parasympathetic branches. The sympathetic nervous system is located in the spinal cord and it sets in motion the physiological transformations that occur during the fight or flight response. The autonomic nervous system activates the production of norepinephrine during stressful moments. The parasympathetic nervous system originates in the medulla, at the base of the brain, and runs through the spinal cord. It works ceaselessly to balance the sympathetic nervous system. It counters the flight or fight response by setting off what is known as the ‘rest and digest response.’ It is responsible for bringing about homeostasis after a stressful period. It promotes the production of the neurotransmitter acetylcholine, which calms the mind and the overall physical body. The practices of Yoga Adityam, unlike most Western exercise systems, focus on calming the mind and nervous system, rather than stimulating the heart. Rather than inducing the secretion of norepinephrine, which creates the ‘fight or flight’ syndrome, the various exercises of Yoga Adityam aim to induce the secretion of acetylcholine into the body, which helps one gain deeper and deeper levels of peace and relaxation. By slowing down our breathing, and by the retention of the breath during the practice of asanas, we can trick the body into producing acetylcholine. Conversely, if we breathe rapidly, without holding the breath, and perform strenuous and rapid exercises like running, aerobics, or anything that requires the heart rate and breath to speed up, the sympathetic branch becomes activated instantaneously, and therefore norepinephrine, the neurotransmitter responsible for vigilant concentration, will be produced. In that scenario we are obligating the physical body to imitate a stressful situation. In many cases, the psyche of the person plays right along, and starts generating fearful thoughts, and the emotions which accompany them follow, like a cart following a horse. Unlike animals, humans don’t need an external threat to trigger the fight or flight response; a single fearful thought can do it. Our mind often becomes our own worst enemy. We can become anxious, stressed out and even panicky just by worrying – and this has powerful negative effects on our health. Allowing fearful or angry thoughts in our mind can result in ailments such as ulcers, heart disease, tachycardia, indigestion, ischemia (which creates intense pain in the body), fibromyalgia, restriction of blood vessels, excessive salivation, shaking, dizziness, and vertigo. A pattern of negative thinking can even cause fatal heart attacks. The stress chain reaction is set in motion in the amygdale (oval-shaped groups of nuclei situated close to the center of the brain) by either rapid breathing (which affects the mind and body negatively), or by thinking fearfully of the future (which also affects the physical body and breath). Either one of these will generate a neural reply in the hypothalamus that fires the pituitary gland. The pituitary then secrets the hormone ACTH, which immediately incites the adrenal glands to liberate the neurotransmitter epinephrine. This internal chemical reaction provokes the system to manufacture the hormone cortisol which increases the blood sugar levels, and this, in turn, stresses the pancreas. Cortisol indirectly increases blood pressure and suppresses the immune system. These reactions cause an abrupt increase of energy in the body. That may be useful if you’re facing a physical attacker, but if all you’re facing is your worried thoughts, and that kind of thinking is habitual for you, then it’s quite harmful for the body. It’s very hard on the cells of the liver, and the distribution of excess cortisol throughout the entire system diminishes your store of precious and difficult-to-acquire fatty acids. Stress produced by incorrect breathing can also increase the intensity of negative emotions such as fear, anger and anxiety. This can lead to physiological and psychological disorders such as insomnia, angina, migraines, depression, addictions, irritability, panic, and phobias. Stress and fast breathing combined can compromise the immune system. Anger, when intensified by shallow breathing and the hormonal injection of the ‘fight or flight’ response, can quickly turn to violence. The practice of Yoga Adityam is the perfect antidote to the ‘fight or flight syndrome.’ Slow breathing and gentle retentions of breath will gradually erase anxiety, and help keep the practitioners strong, healthy, happy and calm. Yoga Adityam is, in fact, a powerful aid to prolonging life. Meditation will come naturally for those who breathe in this way, and a continuous sense of wellbeing will be their lifelong treasure. The practice of asanas and pranayama will gradually alleviate mental illnesses such as post-traumatic stress disorder, and obliterate the stress response appearing in the field of consciousness when someone is remembering past trauma. Even if the practitioner is undergoing an intense anxiety attack produced by a traumatic memory, the breathing techniques of Yoga Adityam can have remarkably rapid and powerful healing results. Asanas are the pivotal point where we embark on a sacred journey, the voyage towards truth. If we practice asanas persistently, our psychological, intellectual, emotional and physiological makeup will gradually become balanced. Through the practice of asanas, yogis come to know directly the fundamental truth that they are not the physical body – or the emotional body, the energy body, the mind, or the intellect – and not even the ecstasies and bliss they feel during their practice. Real yogis are renunciants of practically everything that arises in their conscious field, and yet they understand deeply that the perceiver of all their inner states is none other than the Supreme Reality. Yogis understand that their true Self is inherently omniscient, all-pervading and all-encompassing. And with each practice session, they go deeper into the experience of that Self, which transcends all, and is of the nature of Supreme Peace. Prior to final liberation, however, even the most advanced aspirants are still cloaked in the human condition, and therefore subject to error and delusion. Wise practitioners realize they must take great care to daily deepen their surrender and dedication to the ultimate Truth, and be wary of any kind of temptation. Human beings, no matter how high their intellectual knowledge or level of spiritual experience may be, are liable to be deceived by the potent illusions of their three bodies (physical, subtle, and causal) and the five manifestations that come along with the body (physiological, emotional, mental, intellectual, and blissful). Therefore, even advanced yogis will follow the rules and guidelines of a system of yoga, to protect them from any kind of fall, and lead them safely to the highest level of Enlightenment. By doing asanas and pranayama on a regular basis, they know they can beneficially affect not only the responses of the nervous system, but also stimulate certain glands like the pineal, pituitary, amygdale, hypothalamus, and many other centers of experience that are connected to more subtle grades of existence. This daily practice is like an insurance policy that guarantees they will not and cannot fall. Through Yoga Adityam, practitioners can easily experience a sattvic state, a state of tranquility and emptiness that helps them elucidate their innermost essence, and which permits the manifestation of their inherent divinity to deepen and expand. Eventually, practitioners will realize that their true nature has always been infinitely expanded and enlightened; the only thing that has changed is that the time-bound personality and identity, which previously covered over the reality, has now crumbled. The ego mirage has now disappeared completely, together with the thought process that perpetrated the sense of separation and individuality, and their true Self stands permanently and effortlessly revealed. The goal of Yoga is the discovery that the supreme Reality is our true nature, timeless and yet always here and now, transcendent and yet fully manifest in the present moment. For this, our minds must be beyond the stars, but our feet firmly planted on the ground. This is why practitioners of Yoga Adityam work with the three bodies first (physical, subtle and causal), through asanas and pranayama, so they develop a strong and balanced vehicle in which they can cross the ocean of the illusory mind. The yogi’s body is a highly-tuned vehicle of samsaric transportation, its destination being the far shores of Nirvana. The term ‘samsaric’ comes from the Indian word samsara, meaning worldly existence, or the cycle of birth, death and rebirth. Samsara is often compared to an ocean, the ocean of unconsciousness, ignorance and suffering which is inherently turbulent and stormy, with occasional hurricanes and tsunamis that create destructive tidal waves that leave many lives in ruins. It is this ocean that must be crossed by the individual to reach the golden shores of eternal freedom. How is it crossed? Everything in the mind and in the realm of experience must be renounced and transcended, for it is a great truth that if you can experience something, it is not you. If something comes and goes (and all experience is like that), then it is unreal. Yoga Adityam points you firmly towards that which is changeless, permanent and indivisible, while taking excellent care of the vessel that will carry you safely to the promised shores of Nirvana. The practice of asanas will cleanse the physical body of detrimental toxins, and will in due course eradicate blockages that compromise bodily health. Steady practice of these yoga poses will improve suppleness, agility, dexterity, equilibrium, poise, vitality, stamina, clarity, and bestow a wonderful sense of security and self-confidence. In the meantime they will be preparing all three bodies for the all-important ascent of the Kundalini. As we begin to soothe the oscillating mind by focusing on physical poses, we will probably begin to notice a profound change in our personality. Personality is affected by body posture, and vice versa. For example, if before practicing yoga you had a misaligned physical body structure, with a forward-curved spine, drooping shoulders, caved-in chest, with your head habitually tilted down, with untrusting, insecure eyes, these will almost certainly reflect a personality that is submissive, timid, self-doubting and afraid. By practicing back bends and chest-opening asanas, and consciously changing your posture, you will be changing the foundations of the cellular structure that determine certain aspects of your personality. Your cellular memory will be flooded with new and fresh information about who you are, a new download will be gradually absorbed, and you will find yourself changing dramatically. Within a space of a few months you will become empowered on many levels, and feel much more secure and self-confident. I have seen this hundreds of times and have no doubt whatsoever about it. You can perform a short test of this principle in a single day. If you wake up feeling sad, or depressed, and feel as if you want to cry, try this: instead of putting your head down and collapsing into depression, stick your chest up proudly, bring your chin up, and align your shoulders over your hips. You will instantly see that it is almost impossible to feel sad in this posture. You can directly feel how the change of your stance affects your emotional state. A positive body posture will in turn generate positive thoughts, and these will in due course generate positive emotions and feelings of self-worth. These positive new mental patterns will, in turn, naturally generate a healthier posture. A good yoga instructor will prescribe the right series of poses to disband the clusters of cellular and mental memories that maintain the student in vicious addictive circles, and then slowly will guide them into new understandings of their psychological makeup and how that is reflected in their bodies. The result of such a journey is, first of all, emotional and physical healing, and secondly, a growing level of understanding and experience of the Divine, and eventually the direct recognition and realization of the true Self , which will bestow the practitioners with peace, serenity and boundless energy throughout their entire lives. According to the ancient yoga texts, asanas are intended to not only open, stretch and make the physical body healthy, but also unclog the subtle energy pathways (nadis) within our bodies, destroy ambiguous emotions (kleshas), remove negative indoctrination (samskaras), and transform incorrect behavioral patterns (vasanas). Asanas practiced in combination with retention of breath, bandhas, and Drishtis (as we do in Yoga Adityam), will unchain powerful positive energies that will shift the cellular foundation of personality. This practice will replace the old blueprint, which the ego was using to perpetuate its flawed and limited self-image, with new blueprints of expansiveness, freedom, peace and perfection. As one’s asana practice continues, the body and psyche will gradually become aware of the prana flowing constantly within and without. The practitioners will gradually feel a sense of eternity and infinity abiding deep within them, and be empowered to gently let go of the mind-fabricated illusion of being an individual human being, and discover their infinitely vast true Self.